Water Department Commissioner Randy Conner shared a story with homeowners in Beverly Monday about a recent storm. Conner caused his own basement to flood by removing leaves that were blocking the sewer near his home. The rushing water then spouted from his floor drain. BEVERLY — Water Department Commissioner Randy Conner admitted Monday night that he accidentally flooded his own basement during a recent storm. Conner, a Morgan Park resident, was speaking at a meeting of the Beverly Improvement Association when he shared his experience during the record rainfall on Oct. 14. 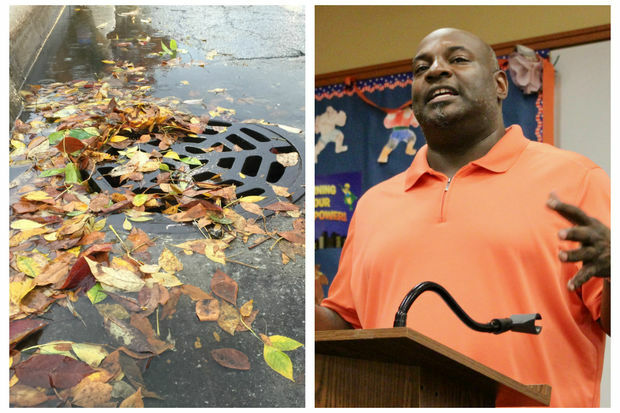 As flash floods moved across the city, Conner noticed the storm drain in front of his house was clogged by leaves, he told those gathered at the Beverly Library. The water had puddled over the curb. Conner said he believed he was doing a civil service by going into the storm and removing the leaves blocking the sewer. Once clear, the water rushed into the open drain, he said. He returned to his house to find about 3 inches of water around his basement floor drain. Conner used a sump pump to clear away the backwater and offered his experience as a warning against such acts. "It sucked the water in so fast, it backed up into the house," said Conner, who was named commissioner May 12. He told the homeowners gathered at 1962 W. 95th St. that he has since learned that leaves blocking the sewers can actually help to pace water intake for city's aged sewer systems. In fact, he said its perfectly acceptable for water to stay puddled the street for six to seven hours after a storm. If the puddles remain after that, Water Department crews will come to check for a blockage or collapsed drain pipe, Conner said. "Water on the street is better than water in the basement," he said. • Disconnecting downspouts from the sewers is a way to greatly to reduce the amount of water entering the system. 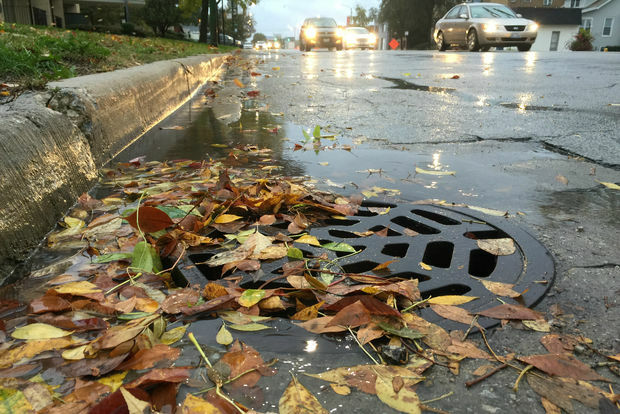 Conner said a typical roof can dump upward of 300 gallons of water into the city's sewers every three minutes during a downpour. He suggested directing roof runoff into the backyard, where the water will eventually drain into the soil — allowing for nature's own water remediation efforts to work their magic. "Now you are taking all of this rain and putting it back into the ground," Conner said. • Using rain barrels can also help divert water from city sewers. In fact, the Metropolitan Water Reclamation District has a program that sells rain barrels in an effort to boost such conservation measures. • Conner also recommended, if possible, avoiding washing clothes, running dishwashers and showering during heavy storms. These tasks also add water to the system that treats both wastewater and rainwater in the same pipes. He added that flushing toilets is generally safe, as it uses only about a gallon of water per flush. Conner later fielded questions from North Beverly residents about recent infrastructure work happening in the neighborhood. He said there are 3.4 miles of improvements happening to sewers and water supply lines in the 19th Ward. This work encompasses 35 locations in Beverly, Mount Greenwood and Morgan Park. Conner said he's asked workers to distribute flyers to homeowners, letting them known both the scope and timeframe for the projects. Some homeowners said they've been left mostly in the dark. Conner encouraged them to sign up for a new system that sends email alerts meant to keep homeowners engaged in the projects. "Everything that we are replacing is more than 100 years old," he said.